For over 40 years, Basil Clovis Hendry was the director of the men’s choir for Mercy Catholic Church in Baton Rouge, Louisiana. If you visited his home, you might have noticed an oil painting of Jesus dressed in a rich azure robe, with his right hand raised in benediction, his left hand grasping an orb. For over five decades, Mr. Hendry and his family were in possession of a treasure of incredible value, a work by none other than the magnificent Renaissance Master, Leonardo Da Vinci. And they never knew it! 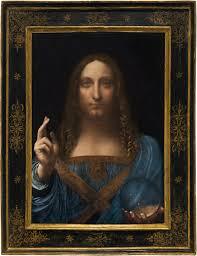 Over the course of the last 500 years, the “Salvator Mundi” masterpiece has graced the walls of Italian Princes, French Kings, Russian Oligarchs and a humble, Southern choir director in Louisiana. Recently, the Da Vinci sold for a whopping $450 million dollars to the King of Saudia Arabia, making it the most valuable painting of all time. What if I told you that you have in your possession a treasure of remarkable value hanging in plain sight? Your soul knows this to be true. For however many years you have been alive, the metaphorical “Da Vinci” has been in your possession. 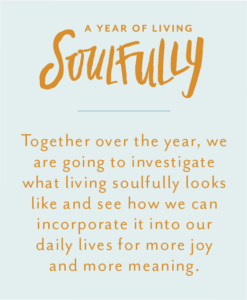 To live soulfully is to recognize your life as the remarkable treasure that it is. If not, like poor Mr. Hendry, we will leave this world without ever knowing the incredible worth “hanging” in our hearts. I am reminded of Jesus’s parable of the man who discovered a great treasure in a field. So moved by the revelation, he sells everything and buys the whole field. He is transformed. Finally, he knows the value of his one precious life; the quality of light, the capacity for hope, and the boundless love within in him. Humbled, he is, that God chose him to participate in the deep, the wide and the Marvelous. You could say, I am early in my digging in the rich field of my life for its true meaning and value, but I have had enough “sparkle” experiences to know that the treasure is real, of great value and waiting to be found. 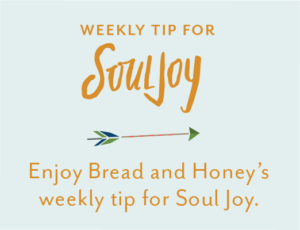 To live soulfully is to see the Divine in all things, especially within myself. Sometimes I have had to learn the hard way that what the world deems as “treasure:” professional success and material possessions, health and beauty, busyness and accomplishment, comfort and security eventually rusts and turns to dust. These earthly treasures please my ego, but my soul is after more. The treasure is God’s faithful presence, in the good and especially in the difficult. Simply to love and be loved by David, my family and friends is a forever gold mine. The remarkable vessel of my body and creative mind. My curious and certain connection to God. That I get to daily wake up to a world decorated in cherry blossoms, scented in honeysuckle, and painted with sunsets. How many times I miss the mark and God never gives up on me. Forgiven and encouraged to try again. Peace, could there be anything more precious? Sometimes, in the quiet, in nature, in great vulnerability, this mysterious peace washes over me and I am rich, truly rich. I know something of the eternal. Wonderful when I can actually hold the treasure in my hand: a newborn baby, a piece of scripture, a gingko leaf, a heart rock. Other times I experience the treasure: a kiss, a rainbow after a storm, my feet in the sand, eyes to the sea, sitting around my dinner table, all six and my husband, safe, healthy and giggling. Always there is treasure in relationships that sustain, inspire and see me more than through. My capacity to weather life’s storms and discover my resilience is my weight in gold. Sometimes it is not what I see, or can hold, but what I intuit in my depths. Within me is a divine spark of love and light and endless hope. Yes, I am human, but more, I am of God. Recently, I fear in the whirl and striving, I have forgotten the masterpiece in my possession. To live soulfully requires a constant remembering of who I am, and why I am here; who God is and what God promises me. I must reclaim my joy and create an energy field of gratitude around me, but especially within me. It is the only way to relish my life in all its fullness and abundance. You don’t find the treasure by having, doing and being more. It is the moment you finally realize “the painting”(your life, all of it) is the masterpiece that the soulful life can begin. Make an inventory of your treasure. Many years ago, a friend of mine said it was her daily salvation to write down three things she was grateful for every single day. Not only did it guarantee perspective, but also insured an ethos of humility in whatever life’s circumstances. Naming our treasure insures we don’t forget the “Da Vinci” hanging at the center of our lives. Gratitude invites grace. Return to this list. Add to the list. Share your list with those who you do life with! Such a joy to read this and to begin my day with. Thank you. You write so beautifully. What a joy it is to begin my week reading your latest message.